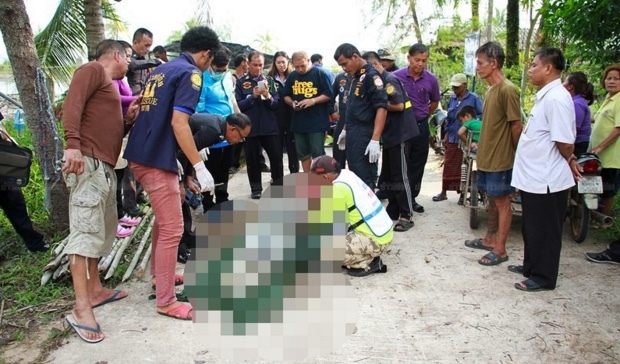 TRAT:-- A fisherman made a gruesome discovery on an idyllic Trat beach Monday - he found the headless corpse of a man. Anucha Tawinwong was collecting rubbish on the Sai Ngern beach at Laem Klat when he thought he saw a dolphin that had been washed up. But it was a man with no head and no arms that police suspect was a victim of murder. While police and medics were carrying out an initial investigation of the rotted corpse, presumed dead around one month, villages found parts of a skull 300 metres down the beach. Police said that the victim was probably a foreign worker on a fishing vessel who had been killed and thrown in the sea. Many bodies wash up on Trat beaches, they said. They resolved to check missing persons records to see if they could find a trace of the victim found wearing just jeans and boxers. After a month floating in the ocean, its not inconceivable that parts such as head and arms have decomposed to a point where they simply fall off or be eaten off. Many bodies wash up on Trat beaches, they said. This is one place to cross of my "to do list"...as I don't want to be done in. Surprised not attributed to a "balcony fall"!! Quite common - "Free Hugs"
Well, Trat's life death. Another place to cross off my list to visit! '... it was a man with no head and no arms that police suspect was a victim of murder.' They're reserving judgement, then, on it being a suicide.